Our purpose is clear – to inspire girls to become extraordinary women. This notion of ‘extraordinary’ means helping support each girl to become the best she can be, as she grows in character and uses her unique gifts, talents and passions to their full potential. Our ethos is grounded in the belief that each Penrhos student will graduate equipped to make a meaningful contribution in the world, at whatever level and in whatever particular way she can. The verb ‘to inspire’ means to ‘breathe life into’ – Penrhos is committed to providing an exceptionally stimulating learning environment and an array of exciting opportunities to ensure each student is inspired to achieve her personal goals and to realise her ambition. The Penrhos educational philosophy acknowledges student phases of development, across which we provide a balanced and diverse learning experience. These four key areas provide a clear focus for current priorities and so that we can plan effectively. Our core shared values define the very essence of Penrhos College, what we believe in and what we stand for as staff, as students, and as a community. Values are commonly defined as intangible, deeply held beliefs that guide actions and interactions. 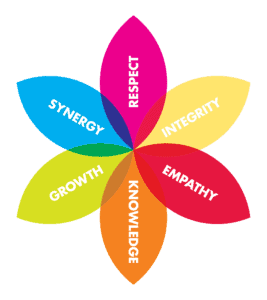 Our core shared values bind us together in a common focus and guide our behaviours in everything we do. As a school of the Uniting Church, inspired by the motto “Strive for the Highest”, Penrhos College provides a learning and working environment that is conducive to the nurturing of Christian faith and the adoption of sound moral and ethical values. Our educational philosophy spans the whole person paradigm of mind, heart, body and spirit, each of which is valued in equal measure – our students are encouraged to ask big life questions and to consider the direction offered by their faith in pursuit of personal meaning. We also encourage our girls (and our staff) to participate in various community service initiatives, to nurture the dimensions of both heart and spirit and to meaningfully give back to others. We are committed to the following set of core shared values, as developed by Penrhos staff. In consideration of our core shared values, we are compelled by the universal and timeless resonance of ‘Respect’, ‘Integrity’ and ‘Empathy’. ‘Knowledge’, ‘Growth’ and ‘Synergy’ enhance our values proposition by helping to underpin what defines our institutional character and they remind us of our reason for being, the premise on which we base our educational framework and the partnerships we forge to secure our future success. In keeping with our core shared values, our perspective is diverse and all-embracing; staff and students of all religious denominations are welcome at Penrhos. Our educational philosophy of ‘the whole person paradigm’ is founded in the need to nurture the mind, heart, body and spirit of each girl for a complete, rounded and balanced education in preparation for life. Our philosophy is integral to all programs and is implemented across the phases of development, helping to shape the growth of each individual student, from the young child in Kindergarten to the young adult in Year 12.